In this radical reexamination of the notion of cannibalism, Gananath Obeyesekere offers a fascinating and convincing argument that cannibalism is mostly "cannibal talk," a discourse on the Other engaged in by both indigenous peoples and colonial intruders that results in sometimes funny and sometimes deadly cultural misunderstandings. Turning his keen intelligence to Polynesian societies in the early periods of European contact and colonization, Obeyesekere deconstructs Western eyewitness accounts, carefully examining their origins and treating them as a species of fiction writing and seamen's yarns. Cannibalism is less a social or cultural fact than a mythic representation of European writing that reflects much more the realities of European societies and their fascination with the practice of cannibalism, he argues. 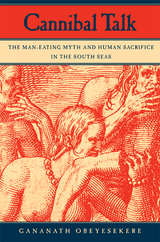 And while very limited forms of cannibalism might have occurred in Polynesian societies, they were largely in connection with human sacrifice and carried out by a select community in well-defined sacramental rituals. Cannibal Talk considers how the colonial intrusion produced a complex self-fulfilling prophecy whereby the fantasy of cannibalism became a reality as natives on occasion began to eat both Europeans and their own enemies in acts of "conspicuous anthropophagy." Gananath Obeyesekere is Professor of Anthropology, Emeritus, at Princeton University. He is the author of Imagining Karma: Ethical Transformation in Amerindian, Buddhist, and Greek Rebirth (California, 2002), The Apotheosis of Captain Cook: European Mythmaking in the Pacific (1997), The Work of Culture: Symbolic Transformation in Psychoanalysis and Anthropology (1990), The Cult of the Goddess Pattini (1984), and Medusa's Hair: An Essay on Personal Symbols and Religious Experience (1984).